This is the second post in a three-part series. The first part was Nick Carr, hypertext and delinkification. The third part is In links we trust. The Web is deep in many directions, yet it is also, undeniably, full of distractions. These distractions do not lie at the root of the Web’s nature. They’re out on its branches, where we find desperate businesses perched, struggling to eke out one more click of your mouse, one more view of their page. Yesterday I distinguished the “informational linking” most of us use on today’s Web from the “artistic linking” of literary hypertext avant-gardists. The latter, it turns out, is what researchers were examining when they produced the studies that Nick Carr dragooned into service in his campaign to prove that the Web is dulling our brains. Today I want to talk about another kind of linking: call it “corporate linking.” (Individuals and little-guy companies do it, too, but not on the same scale.) These are links placed on pages because they provide some tangible business value to the linker: they cookie a user for an affiliate program, or boost a target page’s Google rank, or aim to increase a site’s “stickiness” by getting the reader to click through to another page. I think Nick Carr is wrong in arguing that linked text is in itself harder to read than unlinked text. But when he maintains that reading on the Web is too often an assault of blinking distractions, well, that’s hard to deny. The evidence is all around us. The question is, why? How did the Web, a tool to forge connections and deepen understanding, become, in the eyes of so many intelligent people, an attention-mangling machine? Practices like splitting articles into multiple pages or delivering lists via pageview-mongering slideshows have been with us since the early Web. I figured they’d die out quickly, but they’ve shown great resilience — despite being crude, annoying, ineffective, hostile to users, and harmful to the long-term interests of their practitioners. There seems to be an inexhaustible supply of media executives who misunderstand how the Web works and think that they can somehow beat it into submission. Their tactics have produced an onslaught of distractions that are neither native to the Web’s technology nor inevitable byproducts of its design. The blinking, buzzing parade is, rather, a side-effect of business failure, a desperation move on the part of flailing commercial publishers. 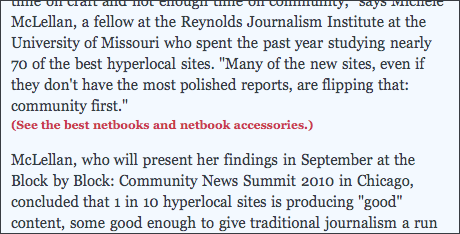 So you’re reading this little piece about local news startups online, you finish a paragraph, and some person or program at Time waves in front of your eyes and yells, “Go read our review of netbook computers!” What, in the name of Tim Berners-Lee, is that all about? Is it “related reading”? An advertisement? Who exactly is it at Time that has so little respect for the work of its own staff, or the attention of its readers? In the meantime, note that Time is conspicuously not providing the link that might have been useful in this passage — to the Block by Block conference the story refers to (which, coincidentally, I’ll be attending). In most newsrooms, business and editorial realms are ostensibly separated by an ethical wall. But Web links often exist in a no man’s land instead. Sometimes links are imposed by the business side; sometimes they are inserted by editorial staff; sometimes they’re fought over. In my days at Salon we tried to establish a clear line: Navigation, ads and peripheral space might be up for grabs, but links within stories were — like the words and images — under the control of writers and editors. Plenty of publications today still adhere to this rough policy. But it’s a hard one to enforce unless your editors and writers are composing their links as they prepare their articles. I think that practice remains the exception. Consider this sad fact: 15 years into the era of Web publishing, most print publications still don’t link at all from inside the text of their articles posted online. They began shoveling their print stories, sans links, into the content-management system way back when; today, they’re shoveling still. How did we get here? Partly it’s because too many editors and reporters waited too long to learn Web basics, and many of the more enthusiastic early adopters fled the newsroom and took their expertise with them. Partly the problem is generational, and thus gradually being solved. But a big part of it is Google’s responsibility. Google is a great tool because it draws meaning from links. And it is a profitable company because it has placed a tiny but real financial value on many links. But by making links a business, Google also made it harder for editors and writers to defend responsible linking. Links became the province of the publisher, not the editor. Even so, Google — and the Web itself — works best when links are made freely, motivated by passion or professional dedication or fun. When the links are made for a fractional cent or buck, we get spam and malware and wastelands of zombie splogs. Rich Skrenta has been arguing for years that Google’s “PageRank wrecked the Web,” and it’s a fascinating notion. (Do note that Skrenta now runs a company that aims to compete with Google.) I don’t believe the Web is wrecked, but I do think the monetization of links has warped it. Of course, it’s possible for links to make meaning and money at the same time; one doesn’t have to exclude the other. 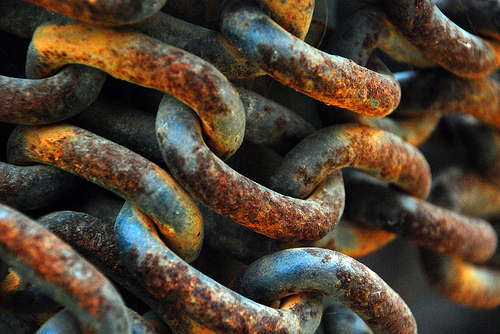 But when driven by the prospect of profit, bad links can begin to swamp good ones. 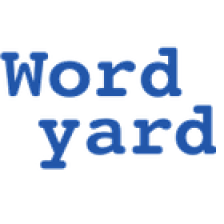 Every link that’s motivated by some affiliate kickback, screen-scraped by a spam blog, or nail-gunned into the body of a news story perverts the original value of linking — and dilutes the Web itself. But we do expect more from the Web, and we can still get it. Careful, creative linking — dare I say conscious linking? — can build trust and authority in ways the corporate linkers can’t even imagine. That will be the focus of my next and final installment in this little series (coming later this week!). Great piece, Scott. You reminded me of the project that I did for Pew in 2000, on Credible.org. Matthew Hawn and I developed a set of standards and practices to increase the credibility of online publishing, and all of them were directed toward transparency and disclosure in linking and other kinds of screen real estate. The MSM publishers we showed it to back then — pick a big name — were completely uninterested in telling people what they were up to with sponsored links &c. It was the Wild West, and everybody was pretty much out to get whatever they could, by whatever means were at hand. And most users didn’t complain because it was all so new, they had no idea what was going on behind the screen. We were too early; now I hope it isn’t too late. I the issue you bring up is far worse in social media. Because social media to date has been hard to monetize, forums and message boards are littered with paid text links that, in most cases, have a tenuous relationship to what’s happening in the conversation on the page. It’s not just the relevancy that’s the problem, though. It’s also a design issue. Links that are inserted into conversations have to do two things: they have assist the user who is following that conversation and the presentation of those links has to fit within the style of the conversation. One size will never fit all in the design and layout. As in your example, if links interrupt the user’s experience, it’s an obvious fail. That was a great essay. I was hoping you would get the information (robots.txt blocked) because it sounds like a big gun. I have seen, and made, some eye murdering web pages that where barely usable in Mosaic days to current time. And for the sake of not giving up that seemly lost information I went for a walk. Sad to say someone is sitting on http://Credible.org/ therefore the robot.txt will be their indefinitely. $ rule. That was a great essay. I was hoping you would get the information (robots.txt) blocked because it sounds like a big gun. I have seen, and made, some eye murdering web pages that where barely usable in Mosaic days to current time. And for the sake of not giving up that ‘kinda’ lost information I went for a walk. Sad to say someone is sitting on http://Credible.org/ therefore the robot.txt will be there indefinitely. $ rule. Excellent insights, though I’m arriving late at this party! One wonders if the hyperlinking tactics of mainstream media will influence the reading/information exploring practices of users, or if users will quickly learn to distinguish the kind of hyperlinking done on any given site. Just as we can recognize patterns in corporate hyperlinking, so too can we recognize patterns elsewhere–e.g. blogs’ inline linking, Wikipedia’s internal vs external linking, etc. My wife and I just noticed this great article.